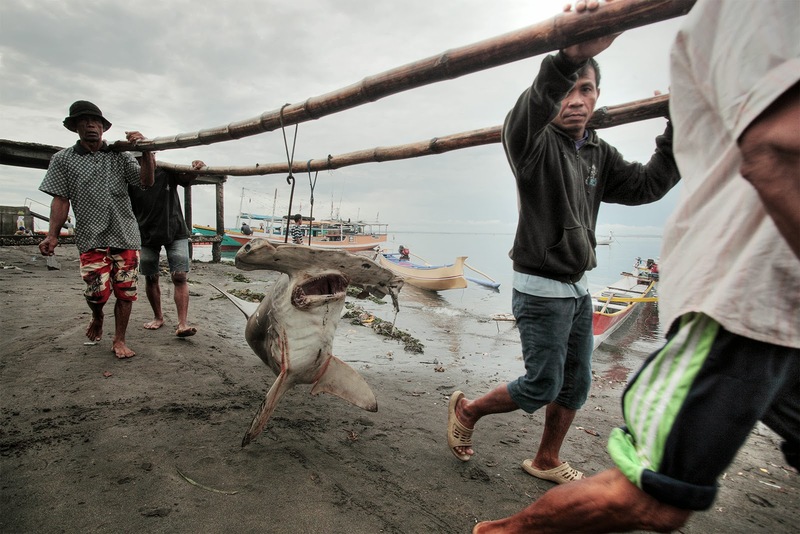 Hammerhead shark at Tanjung Luar fish market on the island of Lombok, Indonesia. I guess it’s only normal for anyone so intrinsically linked to the ocean to have a fascination for the artisan fishing industries in regions less developed. Such is my fascination of that in Indonesia that I would often find myself taking detours out on my trips to these islands in order to see what’s being landed at the local fish markets. My first understanding of the issue was a day when strolling along Jimbaran Beach in Bali that I happened across a discarded dolphin head, of all things to see on a tourist beach. All indications were that it was something dumped there by any one of the multitude of local fishing boats that use this beach as a haul out spot. This is when I began to pay more attention to the discards on the beach and started to be able to translate odd sand covered shapes into those of juvenile sharks, decapitated marlin, puffer fish, sting rays, and all manner of reef and pelagic fish species. I was agog as to why these creatures, if at least caught, were not sold to the masses of local buyers. I’ve always been adamantly disgusted with the shark fin industry. Every instance I’ve documented of the legal landing of sharks has led to the point in time, and recording of, the separation of the fins from the animal on land. Fins that would indeed go to the wholesale buyers at US$100 per kilo and end up as soup somewhere in Southeast Asia. On Bali I have not, to this day, seen any landing of large species, the oceans surrounding the island being somewhat devoid of anything larger than a few inches it seems. 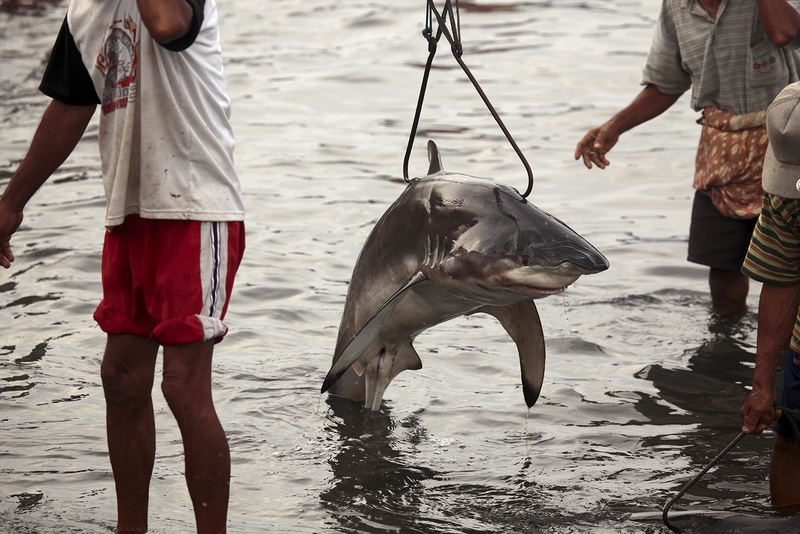 There was once a seasonal fishery for thresher sharks on the nearby island of Nusa Penida but it seems that it may now have collapsed given the lack of captures in the past two years. The sad point being that almost without exception the landed sharks were found to be very heavily pregnant females. The sight of discarded shark fetuses next to their eviscerated mothers was, for me, a tipping point in my desire to investigate this fishery at greater depth. I remain unable to this day to fathom exactly the kind of emotions required to be able to remove unborn pups from a caught animal and simply discard them on a beach. To be able to do this without emotion, without batting an eyelid is something I can’t grasp. I guess for the fishermen, as in any repetitive food processing action, this becomes an automated act, one that requires cold, unemotional robotic efficiency. And thus it continues. 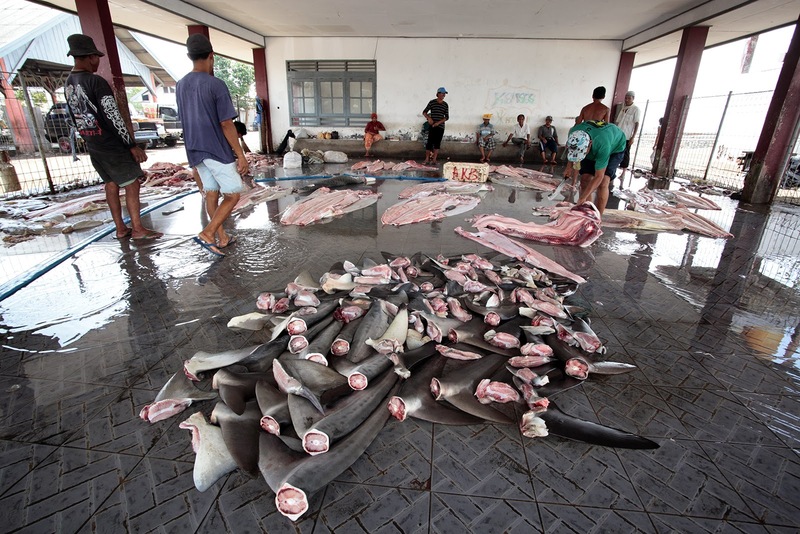 I continued to visit fish markets on the island of Bali whenever I visited the island where ever-decreasing in size catches of sharks would still have their fins removed and dried in the tropical sun. I always thought those who partake in sharks fin soup are imagining themselves to be ingesting the fins of such ferocious ‘beasts’ as great white sharks and tiger sharks. Alas for the most part, especially from Bali, the component fins were originating from smaller bamboo and juvenile reef shark species, quite the pathetic sight to see them being targeted for such a delicacy where the consumer no doubt conjures up imagery of ferocious beasts being landed for his supper. Mark Thorpe is an Emmy winning underwater cameraman aiming to inspire the conservation of our natural World and its wildlife with media production and photography. You can learn more about FINdonesia on Facebook and Indiegogo.